For Eric and Joan Davidson, their love affair with Paris began on their honeymoon back in 1985 and has continued ever since. Over the years, the couple have travelled here often from their home in Laguna Beach, California, sometimes visiting up to three times a year, and their connection with the city was strengthened further when the youngest of their two daughters began studying at the American University of Paris. No wonder then that they decided to cement the relationship by buying their own Parisian pied-à-terre last year. 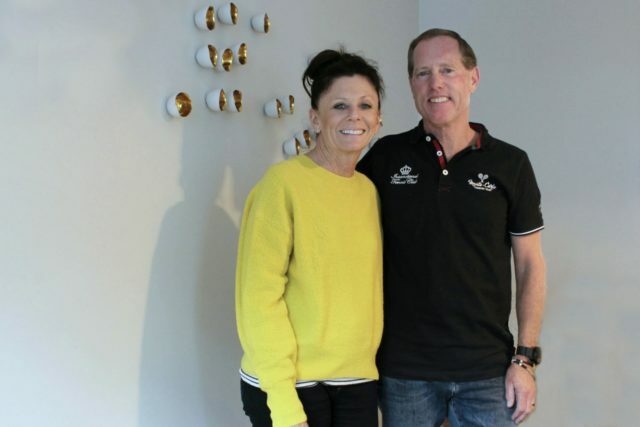 Although the couple had got to know the city well over the years, they are the first to admit that they had no idea where to start when it came to buying a property. 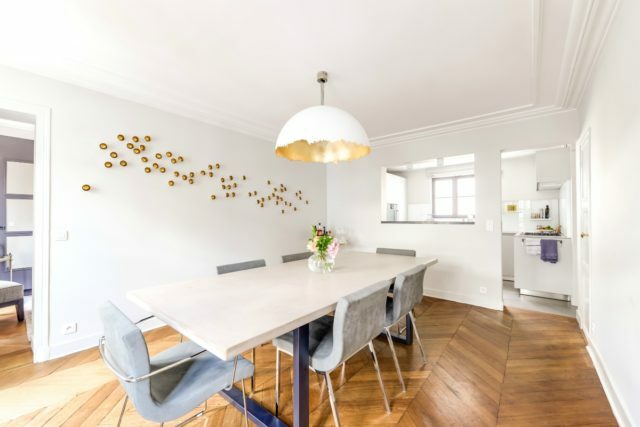 After all, knowing where to go for the best baguette is one thing, but getting the inside track on which neighbourhoods offer the best value for money property-wise is quite another. They were delighted, therefore, when they were introduced to the team at VINGT Paris and discovered that help was at hand. “They were absolutely fantastic all the way through,” continues Eric, who runs his own company specialising in the provision of senior housing. “We just connected with the team there straightaway and they made the whole process so smooth. 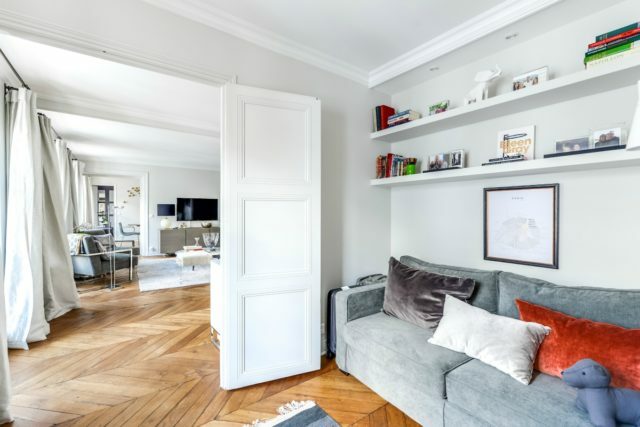 We looked at around 10 properties in total – mostly in the Marais and a little bit in Saint-Germain – but then we found this place, and it just felt like somewhere that we could see ourselves living. That said, there was still going to be a lot of work to do. While they both liked the layout of the apartment, the décor itself hadn’t been touched in a very long time, so was in desperate need of an update. Just as well then that Joan is an interior designer who has run her own design company in the States for more than 25 years. For their new French home, Joan first wanted to lighten the feel of the apartment, making the most of the natural light from the gallery windows, and giving it a fresh, up-to-date feel – while also preserving the lovely original features. On the other side of the apartment, they had also discovered a ‘secret’ window, which had long ago been blocked up, so opening that up again was a priority. In addition, they were keen to replace the kitchen and bathroom and to re-do the master bedroom, not to mention moving a couple of internal walls. So, no small undertaking – and all in their second language. 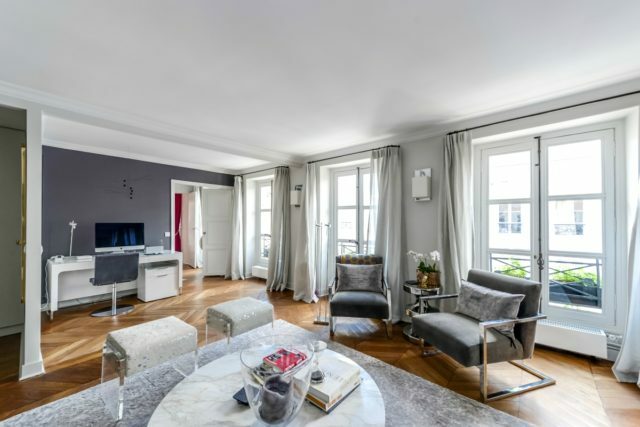 Thankfully, this was where VINGT Paris was able to help once again, with one of their interior design specialists, Henry Personnaz, project-managing the renovation. Working under Joan’s careful direction, he co-ordinated all the necessary construction and decoration work while also assisting with other aspects of the project. 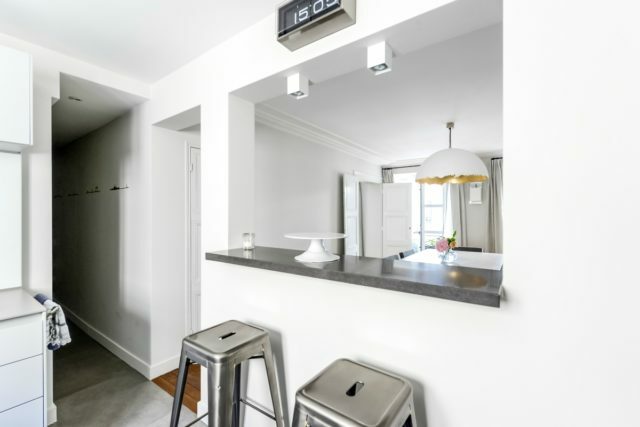 Visiting the apartment today, it looks like something straight out of a magazine shoot, with the state-of-the-art fittings and modern décor working in harmony with the historic features. It feels light, airy and super-stylish and yet the place still has soul. In terms of the new décor, the starting point was a remarkable piece of gold wall art that adorns one side of the dining room. Sourced by Joan from a little artisan shop at Laguna Beach, it comprises 60 pieces of gold-painted porcelain – all of which had to be individually mounted. “You should have seen the faces of the contractors when I told them that,” laughs Joan. “The plaster here is very hard, and it’s therefore very difficult to hang anything, so they thought I was nuts! Also, the lady at the shop had said the best way to plan the design was using Post-It Notes, so I have these hilarious photos of little yellow pieces of paper all over the wall before they began. But they, the installers were very proud of themselves when it was all finished. Now that the renovation is complete, the couple are enjoying their new double-life living between Paris and California. They say their favourite things here are being able to walk everywhere, unlike back home where a car is a must, and visiting the great local markets and world-leading art galleries on their doorstep. They are also just around the corner from historic department store, Bon Marche, and like to treat themselves at one of the lovely patisseries in the neighbourhood. 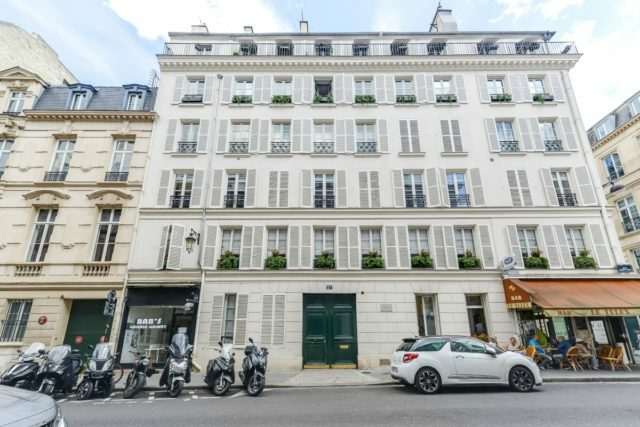 So, now that they are living the dream as it were, what advice would they have for other people thinking of taking the Parisian plunge or planning a renovation? Any particular tips they’d like to share or handy hints to impart?